If you are planning a visit to Maine, you will drive through or fly into Portland, our biggest city (population 60,000.) My state is known for lobster, but it should also be known for the sushi caught in the Gulf of Maine. My husband Henry, who teaches Japanese Politics at Bowdoin College, was my fellow restaurant critic. Proud parents are coming for Bowdoin Commencement this weekend (congratulations class of 2010!) and several blog readers are vacationing in Maine: this post is dedicated to you. Itadakimasu! Food Factory Miyake (above) serves gourmet/fusion cuisine that tastes as good as the best meals we’ve had in Japan. We’d recommend the $15 or $25 set menus for lunch, which change daily. The head chef is Korean and trained in Tokyo, but he adds Western accents. He serves local organic produce when available. If you don’t eat raw fish, there are other options. Miyake’s signature dish is their uniquely garnished sushi platter (above.) The salmon was served with bacon and the fish in the right corner had a mushroom sauce. The fish was so fresh, it melted in my mouth. The toppings added an explosion of complimentary flavor in combinations you would never expect. It was like having a plateful of amuse-bouche at the finest French restaurant. This is not a meal to rush. The location (129 Spring St.) is a bit remote, but there is public parking across the street. 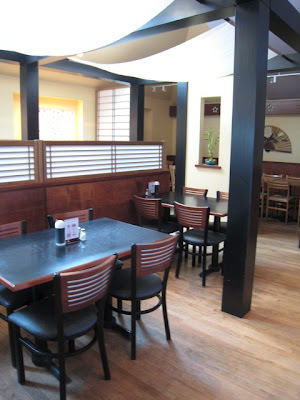 If you prefer more westernized Japanese food or are dining with children, go to Sapporo, the first Japanese restaurant to open in Maine (1984.) The owner is Japanese. Sapporo has all the usual favorites but done exceptionally well. Local crab is used in the California Roll. Our children love the Combination Lunch Bento Boxes. My Japanese sister-in-law was impressed by the quality of the food. Sapporo (my photo at right) has a pleasant atmosphere and outdoor seating. The prices are very reasonable, and the service is prompt. We are regulars with our kids. Our Japanese friends in Maine favor Benkay (last photo), which serves more traditional dishes. The head chef is Japanese. Benkay is close to the ferry terminal and in walking distance of Sapporo. 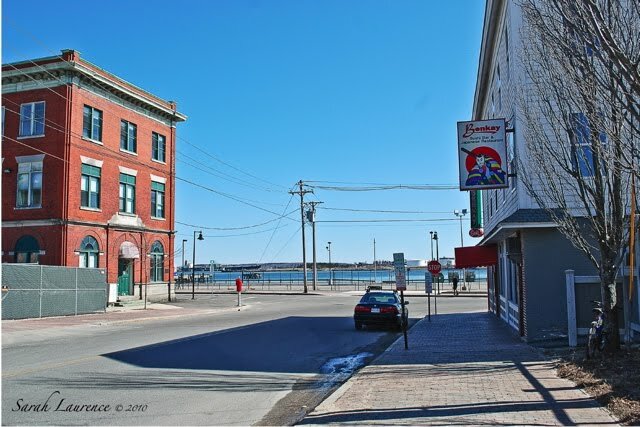 Both are on waterfront Commercial Street and have free parking. None of these restaurants are truly traditional. 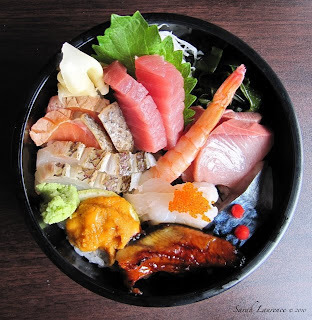 In Japan restaurants are usually specialized sushi/sashimi bars, yakitori bars, curry houses, Buddhist vegetarian restaurants or noodle shops etc. Having all types of cuisine in one restaurant is a Western convention. Still, the food at these three Portland restaurants tastes authentic. Reviewers' Disclaimer: we paid for our meals and were not compensated for these reviews. Everything on the plate looks so lovely! Presentation is an art, and the Japanese have mastered it. If everything goes as planned, we will be visiting Portland in September (family affair), and I'll be sure to ask my relatives to steer us in the direction of these places you've recommended. Thanks, Sarah. That is a beautiful plate! Thanks for the recommendations. I do plan on visiting Portland as soon as humanly possible! Congrats to all the grads and yum on the sushi! I'm a Benkay fan, myself. 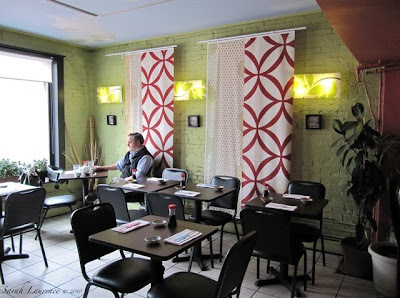 But since you mention Bowdoin parents, I'm putting in a plug for Little Tokyo in Brunswick. On any given Saturday night it's packed with Bowdoin students and locals. Our family loves it! I've only tried Japanese food twice and loved it. Although since the joint was a Thai buffet restaurant the jury's still out on whether the sushi was Japanese or not. It was delicious nonetheless. W2w, good point! The beautiful presentation was part of what made Miyake feel so authentically Japanese. Portland will be a fun spot for your family reunion. Alyson, you will love Portland. It has lighthouses too. Tina, the Bowdoin students are graduating on Saturday. Exciting! Maria, thanks for mentioning Little Tokyo in Brunswick. The students are mostly there for the mixed drinks ☺. Several people have told me that they had good food at Little Tokyo, but the one time we went, the salmon was off. Not bad enough to make us sick but enough to dampen our enthusiasm for the fish. We do like China Rose in Brunswick and Miyako (not to be confused with Miyake) in Freeport, owned by the same family. Hi Dave, welcome back! See the link below for London. ACIL, thanks! In London our favorite Japanese restaurant is Jinkichi, reviewed here: Hampstead Fairies and Asian Restaurants. It looks so deliciously healthy. Is it time for lunch yet?? Definitely a post on food as an art form--a lovely review. And I hope you sent a copy of this post to the restaurant! Pamela, I just went out to lunch with my husband after posting this! Cynthia, thanks for reminding me to email the link. Swoon! Look at that first pic. I am SO there, Sarah. your post is beautifully presented and appealing to ALL the senses. You reminded me of the little curry shops in Japan...yum I love their curry and have found the base here to make at home. I am looking forward to returning to Japan later in the year. What beautiful photos, and such a great review for all the to-be visitors in the area! JAPRA, I wish you could join me. Delwyn, you are lucky to be able to visit Japan regularly. Rose, edible art! That’s too bad about your food allergies. Some of the best tuna caught here gets flown to the fish market in Japan. I'll keep your recommendations in mind if I ever find myself in Portland craving Japanese. However, I am still trying to get over that the largest city only has 60,000 - that must be nice. Miyake's sushi platter is a work of art. I want to have that if I ever make it to Portland. I hope Maine's icy waters never lose their fish supply. I find this post a bit poignant -- because the Gulf Coast oil spill is so much on my mind. Les, I used to think Boston was a small city until I moved to Maine. I do enjoy Portland, but when I need a big city fix I visit my family in NYC. Sapphire, the sashimi was amazingly fresh. Fresh crab makes all the difference in California Rolls. A fine sushi restaurant like Miyake in NYC would charge a lot more. It’s a tasty bargain. You write beautifully and fluently. Any unusual wording adds to the charm of your blog. Bee, a friend just came back from visiting the Gulf coast, and it is so depressing for the fishing communities and wildlife preserves. I’ll get to your email and blog later this weekend. It’s a busy long weekend. So good to hear from you! I hope you are feeling better soon. Japanese cuisine for me isn't just refreshing, but elegant. Angie, elegant is the right word. Barrie, you are burning the midnight oil. Good luck with those edits! I've been to Benkays (have to remind myself everytime I utter the name not to say BenGay), but not the others. Thanks for the review. Portland has many, many great restaurants. Too bad food can make a person fat. Keeps me from going out too much. Happy Memorial Day weekend...a wondrous event in the state of Maine. I love it. Elenka, ha! I always want to say BenGay too. The sunny long weekend was perfect and the grey skies today and yesterday made it easier to get back to work.